Santee Electric Cooperative members Gloria Duncan and John McKnight pause to remember their 7-year-old granddaughter, D'Asia Williams, who died in a devastating house fire. "She was a lively, curious young girl and really enjoyed herself out here," McKnight says. The family credits their Christian faith and the support of Operation Round Up for seeing them through the tragedy. 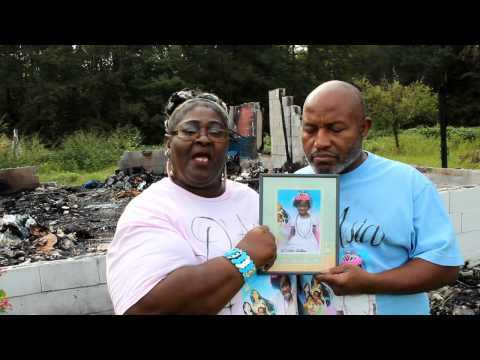 John McKnight and his wife, Gloria Duncan, lost their 7-year-old granddaughter, D’Asia Williams, in a devastating fire last June. Operation Round Up stepped in to help with their basic needs in the days after the fire. “It was like you’re drowning, and someone throws you that lifeline,” McKnight says. In this video, the couple returns to the burned-out home for the first time since the tragedy in order to pay tribute to D’Asia and thank the members of Santee Electric Cooperative for their donations to the co-op sponsored charitable-giving program. Small change, big changes. Operation Round Up marks 25 years of neighbors helping neighbors through small monthly donations on their power bills.